Actor or algorithm: Can you spot Trump fakes? Media captionPLAY ALONG: Can you spot the Trump fakes? Could you distinguish a computer-generated Donald Trump from the real thing - or a professional impersonator? For a BBC conference on artificial intelligence, ASI Data Science created an algorithm that could take any text and read it in the voice of the US president. As an experiment, six sentences were written in Mr Trump's distinctive style and read aloud by an impersonator and by the algorithm. Visitors to the event were challenged to see whether they could tell which was the actor and which was the algorithm. I fared badly, getting the right answer only five out of 12 times, though my excuse is that there was a lot of background noise where the demo took place. But what would happen when someone malicious uses technology like this, to produce fake audio of a politician saying something indiscreet supposedly recorded at a noisy event? 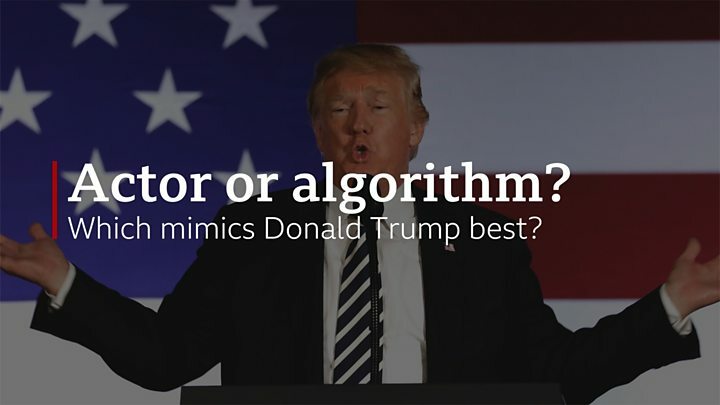 Ilya Feige, who designed the Trump algorithm used in the demonstration, hopes that technology will be created that can differentiate between fakes and the real thing. In the meantime, we are another step closer to wondering whether we can really believe everything we hear and see.